Hiring? Toptal handpicks top iOS developers to suit your needs. Alexander has 9+ of experience in developing applications and over 5+ with the iOS platform (iPhone and iPad). Nowadays most mobile applications rely heavily on client-server interactions. Not only does this mean that can they offload most of their heavy tasks to backend servers, but it also allows these mobile applications to offer all sorts of features and functionality that can only be made available through the Internet. Backend servers are usually designed to offer their services through RESTful APIs. For simpler applications, we often feel tempted to get by creating spaghetti code; mixing code that invokes the API with rest of the application logic. However as applications grow complex and deal with more and more APIs, it can become a nuisance to interact with these APIs in an unstructured, unplanned manner. Keep your iOS application code clutter-free with a well-designed REST client networking module. This article discusses an architectural approach for building a clean REST client networking module for iOS applications that allows you to keep all of your client-server interaction logic isolated from rest of your application code. A user performs some action (e.g., tapping on some button or performing some other gesture on the screen). The application prepares and sends an HTTP/REST request in response to the user action. The server processes the request and responds accordingly to the application. The application receives the response and updates the user interface based on it. At quick glance, the overall process may look simple, but we do have to think about the details. Even assuming that a backend server API works as advertised (which is not always the case! ), it can often be poorly designed making it inefficient, or even difficult, to use. One common annoyance is that all calls to the API require the caller to redundantly provide the same information (e.g., how request data is formatted, an access token that the server can use to identify the currently signed in user, and so on). Mobile applications may also need to utilize multiple back-end servers concurrently for different purposes. One server may, for example, be dedicated to user authentication while another deals with collecting analytics only. Furthermore, a typical REST client will need to do way more than just invoke remote APIs. The ability to cancel pending requests, or a clean and manageable approach to handling errors, are examples of functionality that needs to be built into any robust mobile application. Models: Classes that describe the data models of our application, reflecting the structure of data received from, or sent to, the backend servers. 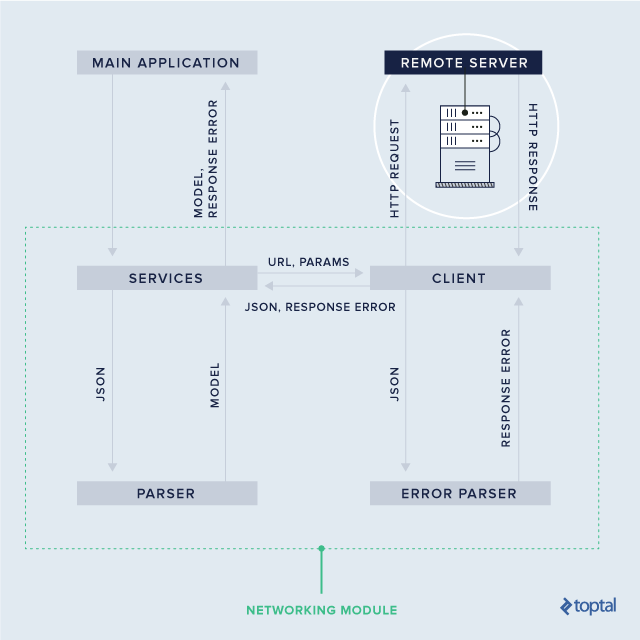 Parsers: Responsible for decoding server responses and producing model objects. Errors: Objects to represent erroneous server responses. Client: Sends requests to backend servers and receives responses. Services: Manage logically linked operations (e.g. 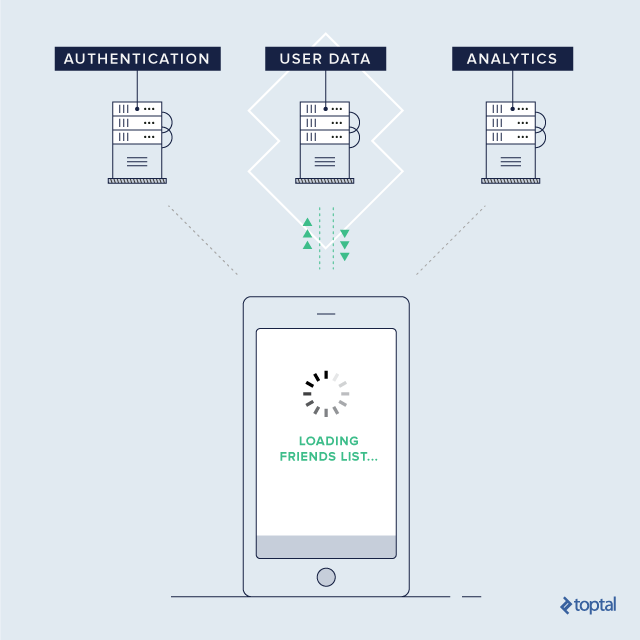 authentication, managing user related data, analytics, etc). The arrows 1 through 10 in the image above show an ideal sequence of operations between the application invoking a service and the service eventually returning the requested data as a model object. Each component in that flow has a specific role ensuring separation of concerns within the module. We will implement our REST client as part of our imaginary social network application into which we will load a list of the currently logged in user’s friends. We will assume our remote server uses JSON for responses. Let us begin by implementing our models and parsers. Our first model, User, defines the structure of information for any user of the social network. To keep things simple, we will only include fields that are absolutely necessary for this tutorial (in a real application, the structure would typically have a lot more properties). To preserve the original default constructor of User, we add the constructor through an extension on the User type. We can define our error objects as an enumeration type. And while we are at it, it is a good idea to make our ServiceError type conform to the Error protocol. This will allow us to use and handle these error values using standard mechanisms provided by Swift (such as using throw to throw an error). Unlike noInternetConnection and other errors, the custom error has a value associated with it. This will allow us to use the error response from the server as an associated value for the error itself, thereby giving the error more context. Now, let’s add a errorDescription property to the ServiceError enumartion to make the errors more descriptive. We will add hardcoded messages for the noInternetConnection and other errors and use the associated value as the message for custom errors. The client component will be an intermediary between the application and the backend server. It’s a critical component that will define how the application and the server will communicate, yet it will know nothing about the data models and their structures. The client will be responsible for invoking specific URLs with provided parameters and returning incoming JSON data parsed as JSON objects. First, we declared an enumeration type, RequestMethod, that describes four common HTTP methods. These are among the methods used in REST APIs. The WebClient class contains the baseURL property which will be used to resolve all relative URLs that it receives. In case our application needs to interact with multiple servers, we can create multiple instances of WebClient each with a different value for baseURL. The Client has a single method load, which takes a path relative to baseURL as a parameter, request method, request parameters, and completion closure. The completion closure is invoked with the parsed JSON and ServiceError as parameters. For now, the method above lacks an implementation, which we will get to shortly. var components = URLComponents(string: baseUrl)! Here we simply add the path to the base URL. For GET and DELETE HTTP methods, we also add the query parameters to the URL string. Here, we first create a URL using the constructor from the extension. Then we initialize an instance of URLRequest with this URL, set a few HTTP headers as necessary, and then in case of POST or PUT HTTP methods, add parameters to the request body. // Sending request to the server. Add common parameters.. This can include common parameters such as an application token or user id. Create the URLRequest object, using the constructor from the extension. Send the request to the server. We use the URLSession object to send data to the server. Parse incoming data. When the server responds, we first parse the response payload into a JSON object using JSONSerialization. Then we check the status code of the response. If it is a success code (i.e., in the range between 200 and 299), we call the completion closure with the JSON object. Otherwise, we transform the JSON object into a ServiceError object and call the completion closure with that error object. The FriendsService class contains a client property of type WebClient. It is initialized with the base URL of the remote server which is in charge of managing friends. As previously mentioned, in other service classes, we can have a different instance of WebClient initialized with a different URL if necessary. The loadFriends method, when invoked, prepares all the necessary parameters and uses FriendService’s instance of WebClient to make an API request. After it receives the response from the server through the WebClient, it transforms the JSON object into User models and calls the completion closure with them as a parameter. friendsTask?.cancel() //Cancel previous loading task. In the above example, we are assuming that the function friendsButtonTapped is invoked whenever the user taps on a button intended to show them a list of their friends in the network. We also keep a reference to the task in the friendsTask property so that we can cancel the request at any time by calling friendsTask?.cancel(). This allows us to have a greater control of the lifecycle of pending requests, enabling us to terminate them when we determine that they have become irrelevant. In this article, I have shared a simple architecture of a networking module for your iOS application that is both trivial to implement and can be adapted to the intricate networking needs of most iOS applications. However, the key takeaway from this is that a properly designed REST client and components accompanying it – that are isolated from the rest of your application logic – can help keep your application’s client-server interaction code simple, even as the application itself becomes increasingly complex. I hope you find this article helpful in building your next iOS application. You can find the source code of this networking module on GitHub. Check out the code, fork it, change it, play with it. If you find some other architecture more preferable for you and your project, please do share the details in the comments section below. Alexander has over nine years of experience in developing applications and over five years with the iOS platform (iPhone and iPad). He has worked in teams of various sizes from small teams to very large groups. He also has experience working freelance on and off over the past five years. Alexander is a self-motivated and communicative professional who can work well independently and with a team. Thanks a lot, I like the way you do it without any dependencies! Hi Andrew. Thank you for pointing out the typo. We have fixed it. I enjoyed the article. Thank you. Great stuff! Thanks. Im new to programming and im wondering about the nomenclature of functions like this. Is there any reason to use "loadSomething" over something like "getSomething", "fetchSomething"? - Is there any de facto naming convention or anything? Hi It is nice to upload json data. How to upload images with multipart header with this client? There is any suggestion on how to implement the KeychainWrapper for the auth token?